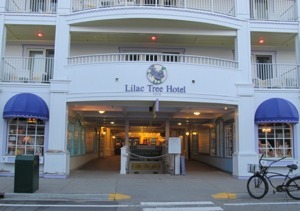 With thirty-nine uniquely appointed suites, the Lilac Tree Suites and Spa reflects the French, English and American heritage of Mackinac Island. Each spacious suite has a living room and a separate sleeping room. No two suites are alike. The unique decor is accented with variations of wood, wicker and iron. Traditional antiques and modern fixtures combine to create an atmosphere that is unavailable anywhere else on the island.